Brawlout is the party fighting game from Angry Mob Games, designed for couch play, online ranked matches and competitive tournaments. The game packs a punch with couch and online play modes, blending platform fighter mechanics and traditional fighting game play into a stylish and fluid battle royale. There are currently six original characters and two popular indie characters to choose from that allow for varied play styles. 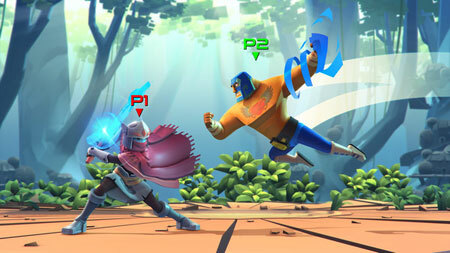 Each character has their own unique playstyle, catering to specific character archetypes seen in other fighters. Combined with familiar movement techniques like wavedashing and airdodging, the game adds some extra mechanics. The Rage Meter builds up as you both deal and take damage, allowing you either break combos with the Rage Burst or unleash hell with the Rage Mode. If you get stuck in the game, check out the video walkthrough and gameplay for the game. This entry was posted in PC Games, Walkthrough and tagged Brawlout Cheats, Brawlout Game, Brawlout Gameplay, Brawlout Guide, Brawlout Hints, Brawlout Review, Brawlout Solutions, Brawlout Strategy, Brawlout Tips, Brawlout Walkthrough by Marvin. Bookmark the permalink.